Finding a healthy food to feed your pet can be a daunting task, but at Abracadabra we like to make it easier for you by carrying only natural USA made pet food with no fillers or by-products. Nulo is a high-performance premium pet food that shares our passion for quality. Nulo is focused on feeding your pet a healthy and lean diet and gained notoriety by being endorsed by athlete pet lovers. Nulo is an independently-owned pet company based in Austin, Texas. They’re products are manufactured in USDA, FDA, and AFFCO approved facilities in Kansas, Nebraska, and North Dakota. Nulo has developed a network of family farmers that focus on free-range beef, chicken, and turkey, and sustainable wild caught fish that adhere to the requirements of the Monterey Bay Seafood Watch Program. Nulo is also distributed in small batches to provide the freshest recipes that spend less time on the shelf and taste better for your pet. All Nulo pet food is grain free because science has shown us that our pets thrive on high meat, low carbohydrate diets. They do not receive major health benefits from potatoes, tapioca, corn, wheat, or soy, especially when it’s empty ingredients like corn gluten meal or yellow corn. 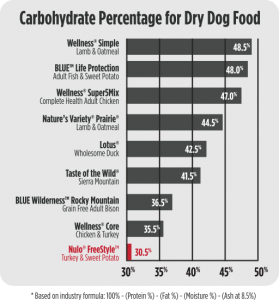 Nulo is one of the only animal-based protein foods on the market with the lowest carbohydrate percentages compared to other grain free pet foods. Most leading premium brands get up to 45% of their protein from plant sources. Our pets require certain amino acids that can only be acquired through animal protein. Dogs and cats are carnivores after all! All Nulo products protein gets 80-85% of it’s protein from animal sources. That’s one of the largest in the industry. Foods with high glycemic ingredients like rice, white potatoes, and tapioca can cause energy spikes and elevated insulin levels that can lead to an onset of diabetes in our pets. Any unused carbohydrates in their system simply turns into fat. Nulo has some of the lowest glycemic indexes on the market, which means more sustainable energy for your pet! Nulo uses ingredients that stabilize blood sugar and reduce the risk of obesity and diabetes in your pet. Nulo has a patented probiotic that has been scientifically proven to survive the extrusion and cooking process. Probiotics are important to aid in proper digestion, which will result in better nutrient absorpion and help prevent the growth of yeast organisms that can cause skin problems and ear infections. 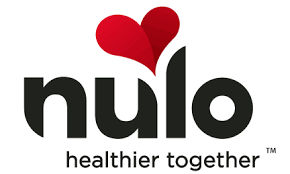 We are proud to carry Nulo in our store because they share our dedication to healthy pets. Stop by for a free sample to see the Nulo difference in your pet!